I pick up my five year old grandson from school on Wednesdays; one day I asked him what his favorite thing was which he got to do at school. His answer was; "Play with K'nex!" He has always loved building things; even as a two and three year old he could sit for literally hours and build things, so I was not really surprised to hear he loved playing with K'nex! I was invited by K'nex to review their new 521 piece building set and am happy to let you know about it in case you have a young builder on your gift list! This set is made in the USA! With 521 pieces there would be dozens and dozens of things a child could build! Encourages imagination, creativity, fine motor skills, interacting, problem solving and focus! Comes in a sturdy tub for storing the K'nex pieces when they are not being played with! 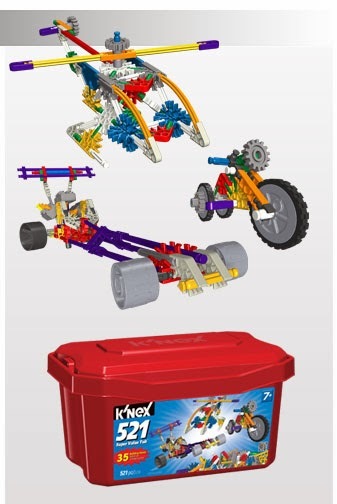 K'nex has this to say about their building set; "Build anything you can imagine with the 521 Super Value Tub! Loaded with 521parts for lots of open building fun! Includes instructions/ideas for 35 unique models including dragsters, ferris wheels, dinosaurs, creatures and more! Parts and built models can be stored in the convenient storage tub." I think this is a set which young builders will spend hours and hours building and creating to their heart's content! I love the colors of the pieces and how they are sturdy pieces which provide a variety of building options! Definitely a box of fun!